What are serological or blood tests for TB? Blood tests for TB, also called serological tests, are tests that are carried out on blood samples. Serological or serodiagnostic tests for TB means diagnosing TB through looking at a blood sample, and specifically looking for antibodies in the blood sample. Some diseases such as HIV can be diagnosed very easily by taking a blood sample, and then doing a procedure that looks for antibodies in the blood sample. But you cannot diagnose TB this way. As a result commercial serological tests for TB, sometimes called serodiagnostic tests (such as the Anda-TB IgG) have very variable results and this generally means low sensitivity and specificity.1“Commercial serodiagnostic tests for diagnosis of Tuberculosis”, Geneva, WHO, 2011 www.who.int/tb/publications/ If a test has low sensitivity, it means that there will be a significant number of “false negative” results. This means that the test result indicates that a person has not got TB when they actually have got TB. Similarly, a low specificity means that there will be a significant number of “false positive” results. These suggest that a person has got TB when they actually haven’t. 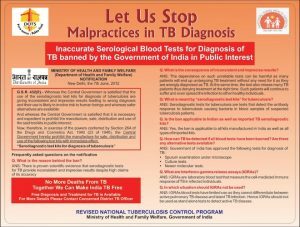 In late December 2012, the Ministry of Health and Family Welfare, took out advertisements in national newspapers, as shown below, again explaining that the use of serological tests kits for TB is banned, because of the lack of accuracy of the tests. The newspaper advertisements, also contained a number of questions and answers, designed to further clarify the situation with TB blood tests. They explained that this does not mean that there are no TB tests available for diagnosing TB. They explained that sputum tests, culture tests and newer molecular tests can be used, and that free diagnosis and treatment for TB is available through the Revised National Tuberculosis Control Program (RNTCP).